On August 19 big Russian military convoy entered Lugansk. Next day on August 20 Russians attacked Heorhiivka village and shot down one Ukrainian military aircraft SU-25 and one helicopter. That attack was kicked back and Ukrainian Army captured 2 Russian Army BMD-2 (military machine for paratroopers). On August 22 Russian “humanitarian” entered Lugansk delivering ammo and other supply for their troops in the city. On the way back the Russian trucks took industrial equipment from 2 factories from Lugansk to Russia. In the next few days Russian troops attacked Khryashchuvate and Novosvitlivka using same tactics that they used in Chechnya destroying every building in those villages shooting from tanks. Ukrainian Army had to retreat. So Russian Army took the road M04 under their control. 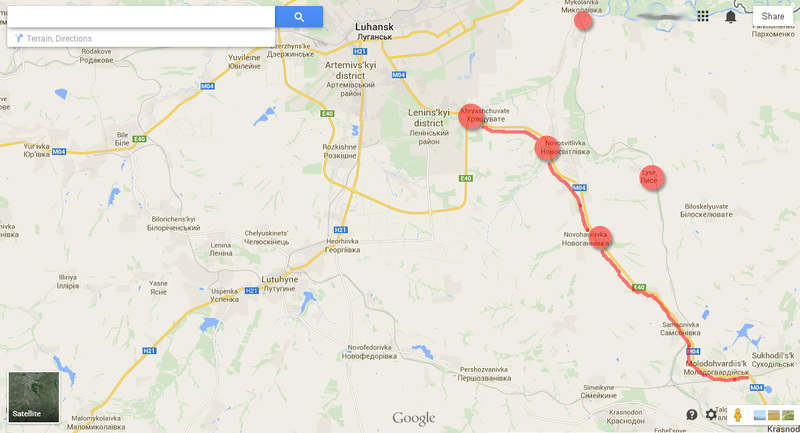 That road goes to Russian border and is totally controlled by Russian Army now. After that Russian government said that they are sending another “humanitarian” aid convoy to Lugansk. The previous convoy came to Lugansk without permission from Ukrainian side and without Red Cross supervision. Only 36 trucks have been inspected out of 280.